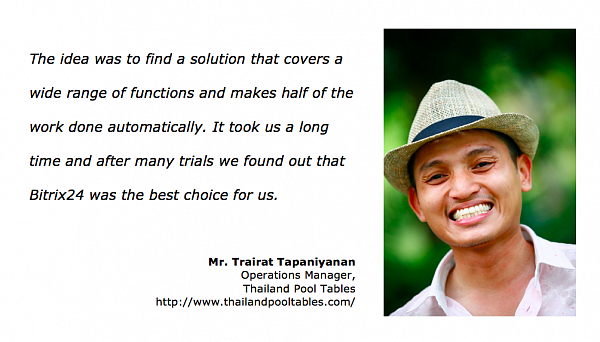 Thailand Pool Tables offers a full scale of the world’s best billiard and home entertainment solution for homes, businesses and establishments around Thailand & Asia. The team collaborates via Bitrix24 from 4 geographical locations. The main Bitrix24 functions that we use are Calendar, Tasks, CRM, Open Channels, Web forms. We are testing the Drive now, hoping to add more functionalities such as Telephony and Email integration with time. We have researched a lot of collaboration software but we let the team make the final decision. The idea was to find a solution that covers a wide range of functions and makes half of the work done automatically. It took us a long time and after many trials we found out that Bitrix24 was the best choice for us. It is constantly improving and new features are released every couple of month, so we are always looking forward to seeing what is new and what is coming up soon. We hope that some of our features that we requested will be added soon (improved Invoicing, easier Links with Emails and improved Absence charts). This would help us cut out excel sheets completely. Bitrix24 did impact the company productivity by increasing interaction within our team, ability to communicate and comment simultaneously on one topic. We have never been able to achieve this level of communication via emails. Ability to share information quickly, to track who has seen it and an immediate feedback have considerably reduced the time-lag between decision making and implementation. We also replaced Skype with Bitrix24 Chat and look forward to dump Dropbox and start using Bitrix24 Drive as it offers more user access control. What’s your favourite Bitrix24 tool? My favourite Bitrix24 feature is the CRM and the new integration with Facebook pages. The CRM really makes a difference for all sales oriented businesses to keep record of all customer interactions and increase our chances of closing deals. The new Facebook integration enables us to dispatch the chat to the right employees even if they are not Facebook page admins. This functionality is really cool. Do I need a CRM? Yes. No. Both. We've got the answer you don't expect.